Every animal is an individual and they have specific dietary requirements. 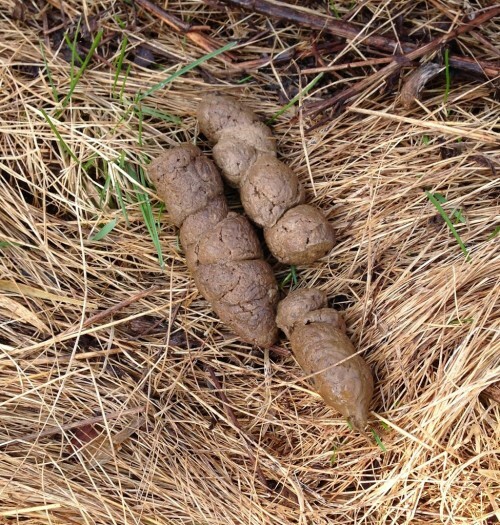 Understanding what your dog’s poop is telling you will help you adjust the diet to suit their needs. We can work with you and your dog to achieve an ideal diet that produces a healthy stool. If your pet’s stool is abnormal, it is crucial to monitor them closely and bring them to the vet if required. 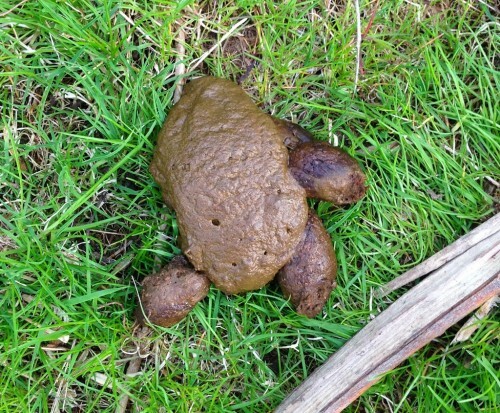 This is a normal, ideal poop for your dog. The odour of this stool is not offensive and it is very easy to pick up. If you step on this stool in the yard, it will dissolve into the ground. If your dog poops on a hill, you might have to put the chase on this stool. This stool is indicative of the small amount of waste produced by a dog or cat that is using much of the nutrients they take in. All that is left is a small amount of waste. The colour can vary depending on what your dog is eating, but the size and firmness is key when classifying a healthy poop. Tazz, 50lb. Bull Terrier with his stool. Tazz’s stool. Penny for size reference. Tazz’s stool after crushing it between 2 plates. 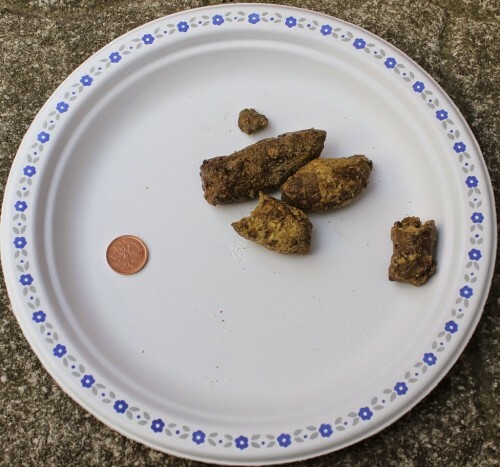 A poop from a 35lb dog. Well formed and leaves no residue. We often refer to this stool as “kibble poop”. This stool has a very offensive scent and leaves a residue when it is picked up. You’ll know when you step on one of these, as it will follow you everywhere. The large size of this stool indicates a pet that is not fully digesting their food. 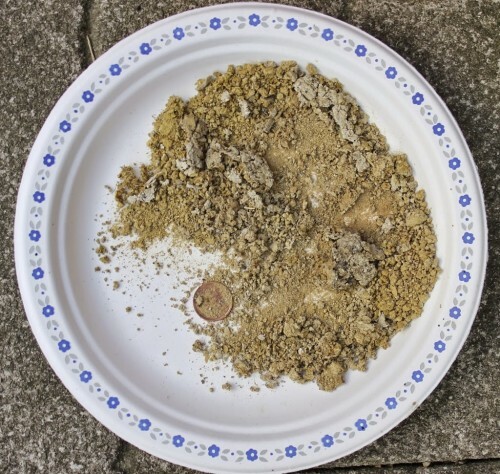 The waste is full of nutrients that the body wasn’t able to absorb. This is also why your dog enjoys the kitty litter buffet. They are enjoying all of the undigested material that your cat has left for them. Kibble fed dog poop. Some formed, some loose. This stool is normal for a few dogs, but for most, it indicates that the dog is getting to much bone in their diet. This stool breaks apart as the pet is defecating. Every animal is an individual so it is important to determine what the cause is for each pet. If your pet is experiencing this type of stool on a raw food diet, try reducing the amount of raw bone you are feeding. 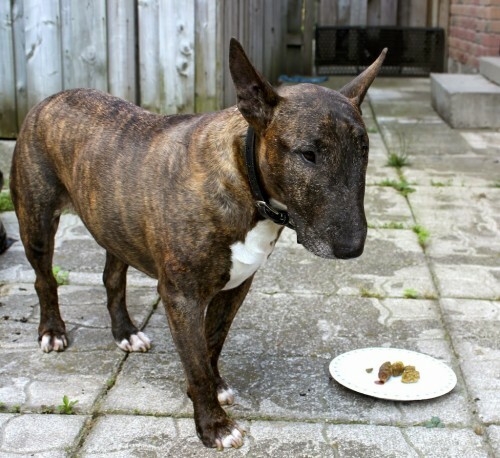 Most dogs do best on 10% digestible bone in their diet. This is a common stool and it definitely is not normal. Feeding too much organ meat causes this stool. This is very stinky and the tar-like appearance is hard to mistake. The best way to avoid this is to prevent it by feeding a balanced, species appropriate diet. Organ meat should not make up any more than 10% of your pet’s diet. Ensure that liver treats are limited as they can be too rich in large amounts. If you are looking for a training treat, Domestic Carnivore can recommend something that won’t cause undesirable stool. If you are making your own raw or buying a brand not offered at Domestic Carnivore, make sure you know what the organ percentage is. Make sure you keep track of what you are feeding your dog. It will make it easier to determine if an abnormal stool was caused by a dietary imbalance or if the pet is truly unwell. It is important to note the colour of the blood. If your pet has blood in their stool, it is not coming from the raw meat. Bright red typically indicates that the blood is coming from the lower intestines, while darker blood means the blood is coming from further up in the GI tract. While bloody stool can be a minor issue, it can also be a symptom of a serious problem. It is best to have your dog checked out by your veterinarian, especially if bleeding continues for more than 24 hours or if it is combined with vomiting or diarrhea. If the blood is caused by IBS or a common upset, slippery elm bark powder can help to soothe and coat the GI tract. This is not a long-term fix and dietary changes along with digestive support supplements may be required. Mucous is the body’s way of protecting itself from irritation. It can be caused by a diet change or upset in the GI tract due to stress, bacteria, inflammation, etc. Dogs that are detoxing from a poor diet can have large amounts of mucous pass. Digestive enzymes and slippery elm bark powder can help to soothe the GI tract during a difficult dietary transition. Layla was fed cooked and seasoned brisket by someone who should have known better. :). It is important to distinguish between diarrhea and loose stool when assessing the health of your pet. Dogs and cats that are experiencing diarrhea often don’t have the ability to control their bowel movements. This stool has no form and can sometimes be explosive. Your pet is likely to be dehydrated and lethargic and you should be prepared to seek veterinary advice. Loose stool, on the other hand, is soft and sometimes unformed, but it is usually not a medical concern. Loose stool is often controllable and while it may still warrant an urgent 3 am poop, your dog is likely to make it outside. These stools have a number of causes including stress and eating something that didn’t agree with them. Diet related causes include too much fat, above ground vegetables, fruit, or poor water quality. Medications and toxins in the environment can also loosen stool. It is important to determine the cause in order to responsibly monitor the situation. If your pet is straining and struggling, you may need to adjust their meals to better suit their dietary requirements. Some food items that can cause pooping difficulty include too much bone and below ground vegetables. Stress and lack of exercise can also contribute to firm stool. Dehydration is also a common cause of constipation. Dogs need moisture in order to pass waste effectively through the GI tract. Owners should ensure the dog is properly hydrated if a pet is having difficulty passing stool. You can also try adding a small amount of leafy, green vegetables into their diet to increase dietary fiber. Omega 3 fish oil can help to lubricate the GI tract in order to improve comfort for your dog. If the problem doesn’t resolve within 24 hours, seek veterinary attention to determine the cause of the constipation. It is important to monitor your pet’s overall health to ensure that you don’t miss a serious condition. While most owners will experience several of these examples throughout the life of their pet, veterinary care is recommended if an unhealthy poop is coupled with other symptoms or if the problem persists for longer than 24 hours. Other symptoms may include vomiting, lethargy, abnormal gum colour (pale or blue/purplish), dehydration, not drinking/eating, restlessness, increased respiratory or heart rate, etc. It’s always better to err on the side of caution than to miss a serious condition and not get to the vet on time. 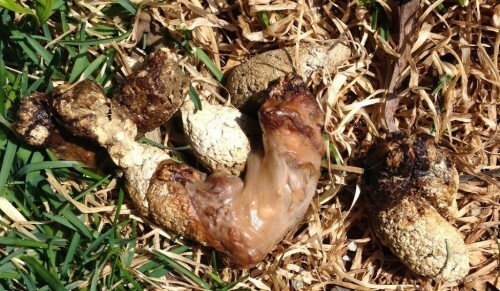 Please remember to pick up your dog’s poop. Earth Rated PoopBags are available with a handy dispenser and refill rolls. Ask us about unscented and compostable options as well.